The BLT is arguably the king of sandwiches and we would eat one every day but sometimes we want to ditch the carbs, y'know? Here's a gluten-free salad version of the lunchtime classic, complete with a simple homemade dressing (hold the mayo). You still get that amazing flavor combo you want from a BLT: crisp, smoky bacon with juicy tomatoes and the cool crunch of lettuce. As an added bonus, this salad also includes slices of creamy avocado because bacon and avo love each other so much they should just get married already. 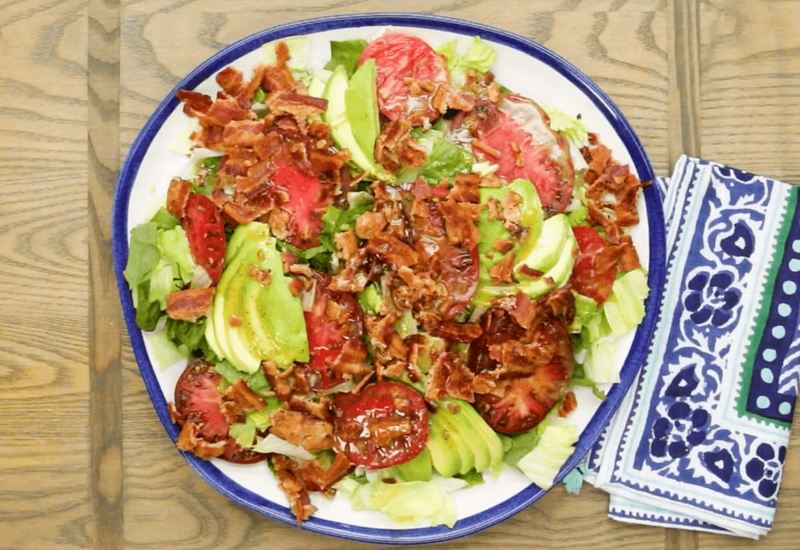 This BLT salad is best when tomatoes are at their peak. A beefsteak tomato is classic but if you want to branch out, look for heirloom varieties at your farmers market. Our favorites for this dish are the ones that are big, meaty, and good for slicing: Brandywine, Cherokee Purple, and Red October. Per Serving: 325 calories; 26g fat; 23.1g carbohydrates; 6g protein; 3mg cholesterol; 1070mg sodium. Bacon salad!!! I love eating healthy-ish like this - sure, it isn't a kale salad with lemon juice, but it's better than the BLT sandwich alternative. A really delicious, simple salad. Everyone loved it. This BLT salad was fantastic! Just like the sandwich, but healthier. I especially loved the simple dressing, so good! The maple syrup was the perfect touch. Can't wait to make this again! Such a delicious salad - quick, easy, flavorful, and convenient for meal prep. The thick cut bacon and avocado are a must. Very good! It doesn't get any easier than this! For something so delicious, this was such a simple salad to arrange. I love how quick the dressing is, and that it doesn't require a blender or any other special equipment. It's a perfect light dinner for the busy weeknights when I'm rushing the kids off to practices. I cooked two packs of bacon in the morning, just so I could save slices to make this salad later that day! The dressing can also be made ahead of time, I actually prefer it chilled. I just stir the maple syrup in right before serving. Also, I used strictly romaine lettuce. This was so easy to throw together!